Oil prices are trading sharply higher this morning, thanks to overnight news that trade tensions may be coming to an end. Crude prices ended yesterday $1.42 higher. Today, crude prices are at $64.67, a gain of $1.25 (2%) since last night’s close. Fuel prices are also rising. Both gasoline and diesel prices rose by roughly three cents yesterday. Today, gasoline prices are up 2.77 cents (1.4%) at $2.0119. Diesel prices are trading at $2.0268, up 3.02 cents (1.5%). Oil prices are rallying in conjunction with other markets thanks to an announcement from Chinese President Xi Jinping promising to keep the doors of trade open to other nations. Amid on-going escalation between Trump and the Chinese government, markets were relieved to hear someone admitting that free trade is good for markets. At the same time, markets are reacting to news of a chemical attack killing 48 in Syria. The Syrian conflict has been on-going for years, and although Syria is not a major producer, they have tight relations with heavy producers such as Iran and Russia. President Trump has said he’s considering military actions in Syria. Given the recent appointments of Bolton and Pompeo, few in his administration would stand in his way. A strike could create significant instability in the region and could potentially draw in Saudi Arabia (on the American side) and Iran and Russia (on the Syrian side). Mansfield just completed compiling our quarterly FN360 publication, with tons of insights and market trends for our customers to act upon. This quarter, we’ve gone one step further and are hosting a webinar to provide additional insights for our customers and partners, including a live Q&A so you can get specific answers. Just one of the topics we’ll cover is how fundamentals impact future prices. 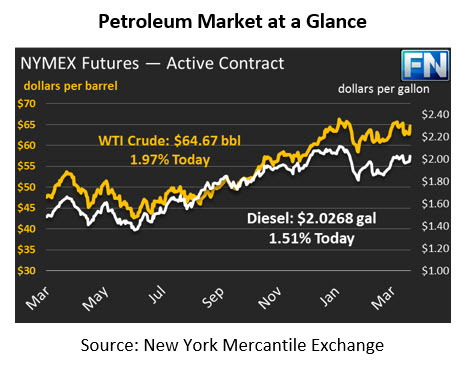 The below chart is taken from the webinar and provides insight into the future of fuel prices. Days of Supply represents how much inventory we have available in the U.S., divided by our daily consumption. 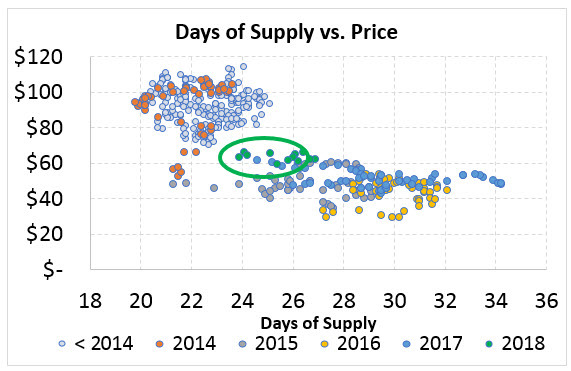 For instance, 300 million barrels of inventory divided by 15 million barrels of daily usage would be 20 days of supply (300 / 15 = 20). As you can see, there’s a fairly strong negative correlation. The less days of supply we have available, the higher fuel prices tend to be. Which way are inventories trending? Tune in to the webinar to find out, and to learn about several other factors impacting prices in Q2.